(1) Plan ahead and book early. Accessible resources are limited, so if you require a wheelchair accessible cabin or hotel room (especially one with a roll-in shower), make reservations early to avoid disappointment -- several months in advance if possible (not several weeks!). (2) When making any type of reservation, whether it be for a hotel, medical equipment, a van, or an attraction, ask VERY SPECIFIC questions. Don't let someone get away with answering you with a quick "yes, we are wheelchair accessible," because a lot of times they really aren't. Let them know exactly what requirements you are looking for and make sure that the reservationist understands what you mean, because a lot of times they will just continue to say "yes, yes, yes," even though they really aren't sure what you are talking about. We had 3 great examples of this on our trip to Kauai and the Big Island. See Kauai/Big Island 2002. (3) Always check and double check reservations. Nothing is more frustrating than thinking you have a reservation for something, only to find out when you arrive that they wrote down your reservation wrong, or worse yet no longer have a record of it at all. (1) When booking a flight, be very specific about your situation and the requirements you need ie. an aisle seat, bulkhead seats, seats beside each other, what type of wheelchair you are in (manual or electric--wet cell or dry cell batteries), and whether or not you will need an aisle chair and assistance boarding the plane. (2) If you have a choice between a direct, nonstop flight and a slightly cheaper flight that has connections, ALWAYS take the nonstop flight. You may be saving a little money by choosing the connecting flights, but the money you save just isn't worth the hassle of having to change planes and the potential problems that go along with it. Changing planes means that the baggage handlers have to handle your wheelchair one more time, and unlike the first leg of your trip where you can show the people who take your chair how they should handle it, you can't give any instructions to these handlers. They will simply move your chair from one plane to the other, and HOPEFULLY they will get it there without damaging anything or leaving any parts behind. Changing planes also means that they have to handle your luggage one more time, and I'm sure most people know someone who has had the experience of an airline losing their luggage temporarily. 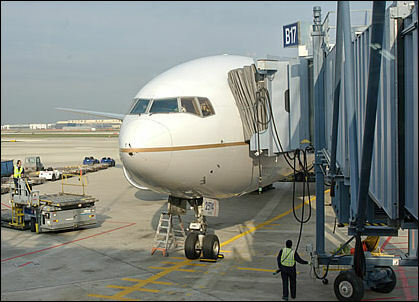 Connecting flights can also be a problem if one segment of your flight itinerary is early or late. For instance, if your first flight is a couple hours late departing, you may miss your connecting flight. It happens all the time. The airline would hopefully get you on another flight departing soon, but you may have to wait until the next day to get a flight to your destination. (3) Have your wheelchair or scooter routinely serviced before you go so that you are sure everything is in working order for the trip. (4) Bring some extra wheelchair or scooter parts (such as tire tubes) along on your trip in case you run into trouble during your travels. You never know when you are going to get a flat tire. It is also a good idea to bring some basic tools (screwdriver, allen keys, duct tape, etc.) along in your checked baggage in case you need to do a little repair work on your chair at your destination. (5) Get one of those neck cushions for the flightit could quite possibly be the best 7 dollars you will ever spend. For my first few flights I was always incredibly uncomfortable sitting in the airplane seat. Since my Roho cushion is a few inches thick and I sit on it in the plane, I sit a few inches higher than everyone else. This means that there isn't anything to lean my head on because my head towers above the back of the seat. Needless to say, sleeping was almost out of the question which makes it a very long, uncomfortable flight. Well, some nice lady must have noticed my discomfort on our flight back from Maui in 2002, and she insisted that I try her inflatable neck support. It was amazing -- I've never slept so much on a plane in my life! I'll never go on a long flight again without one of those. (6) If there are sensitive or delicate areas on your wheelchair that you will not be able to remove and take with you into the cabin of the plane, put labels on these areas so that the baggage handlers know not to touch or remove them. For instance, I always label my tilt box with a big piece of tape saying "PLEASE DO NOT REMOVE." I also label my brakes with a big piece of tape, including up and down arrows indicating which way my brakes go to engage or disengage the chair. This is important so that they are not wrecking my chair just figuring out how to push it. I have found that the label idea has generally worked quite well. Unfortunately, it is apparent that not all baggage handlers know how to read, as I found out one time in Hawaii (see Big Island 2002). (7) Check and double check your reservations ie. seats beside each other, aisle seat, aisle chair etc. (7a) When you are checking in for your boarding passes and they are tagging your luggage and wheelchair(s), ask them to "gate-check" the wheelchair you are sitting in. Then they will put a tag on your wheelchair that tells the baggage handlers at your destination to immediately bring your wheelchair to the gate (the door of the plane) rather than bringing it to the baggage claim. This way you can immediately transfer back into your wheelchair outside the door of the plane at your destination rather than having to sit in an airport wheelchair first and be pushed to the baggage claim by an airport official to meet up with your chair. Many check-in agents will automatically gate-check the wheelchair you are sitting in, but sometimes you have to ask them if you get an inexperienced agent. Note that it is not guaranteed that they will be able to bring your wheelchair back to the gate at your destination as it depends on whether or not there is an elevator nearby to bring the wheelchair up from the cargo hold. If not, they automatically just bring it to the baggage claim. (7b) When the check-in agents are tagging your luggage, a lot of agents like to tag the checked luggage of a person with a disability with priority stickers so that they are the first bags off of the airplane and therefore the first bags on the baggage carousel. However, people who need wheelchair assistance are always the last ones off of the airplane, and I have had it many times where most of the passengers on my flight have already picked up their luggage and left by the time I arrive in the baggage claim. Personally, I don't like the idea of my bags going round and round on the baggage carousel when I'm not there. There doesn't seem to be much point. So, if you see the checks-in agents putting priority stickers on your checked baggage, you might just want to tell them that it's not necessary (unless of course you would like it). (8) Immediately after you transfer out of your wheelchair (and before they take it away), remove any loose or vulnerable parts from your wheelchair (if possible) and take them onto the plane with you. Baggage handlers are notorious for manhandling wheelchairs. They love to take apart anything they can, so it is important to remove loose parts of your chair and just store them with you on the plane. This includes things like a joystick and footrests. You don't have to put them in your carry-on luggage--just put them in the overhead compartment above your seat. If you do not remove them, there is a chance that they will get damaged or even go missing by the time you get your wheelchair back at your destination (see Australia 2000). (9) Secure any loose or moveable parts on your wheelchair that you can not take on the plane with you before they take your chair away to the cargo hold. For instance, if you are checking an electric wheelchair that has a swing-away joystick (or some other moveable part), tape it together so that it is secure and unable to swing out or move. Moveable parts are likely to end up getting damaged in the cargo hold. (10) For those in electric wheelchairs, take the batteries out of your wheelchair yourself at the airport. The minute I get transferred out of my wheelchair at the airport, I immediately have my attendant take the batteries out of my chair and just sit them on my seat. Then the baggage handlers wheel my chair away with the batteries on my seat. If your batteries do not come out of your chair, make sure you disconnect them and show the airport handler who will be taking your chair away that they are disconnected. It is much safer to disconnect the batteries yourself rather than let the baggage guys have to figure it out by themselves later. You never know what kind of damage they will create just figuring out how to disconnect the battery. They may disconnect every single wire on your chair to ensure that the chair will not be a danger in-flight. I have heard many stories from people who have spent 2 or 3 hours at the destination airport trying to re-connect all of the wires that the baggage handlers needlessly disconnected. Baggage handlers are EXTREMELY paranoid about the storage of batteries during the flight, especially wet cell (acid) batteries. As a basic rule, it's just better to take as much of your chair apart as possible on your own. The less work the baggage handlers have to do, the less chance of them damaging your chair. So, take the batteries out yourself, explain to them exactly what kind of batteries they are and how they should handle them, and then you "should" be fine. (11) Using the bathroom. No matter what the airlines tell you, bathrooms on board airplanes are not very accessible at all -- especially for someone who might require assistance from a caregiver. They are incredibly small and can really only fit one person. The best advice I always give is to (a) watch what you eat and drink that day so that you do not have to use the bathroom during the flight, or if you think it is inevitable that you will need to use the bathroom at some point, (b) try at the very least to use the bathroom inside the airport just before you board the plane so that you hopefully won't need to use the one on the plane during the flight. The bathroom in the airport will be bigger and far easier to use than the one on the plane. If you do have to use the bathroom on the plane during the flight, it should not be a problem for most airlines. The general practice is that the flight attendant will bring the onboard wheelchair to your seat and help you wheel to the bathroom, although if you require help inside the bathroom and transferring into the chair, you must provide your own caregiver to assist you for that. If you think you may have to use the bathroom on the plane during the flight, make sure to follow up with the airline at the time of reservation and again a few days prior to the flight to clarify their policy and ensure that they will have an onboard wheelchair on your flight. (12) Dysreflexia. Just a note for quadriplegics who may have the same experience I had. The first 3 or 4 times I flew, I always had a slight case of dysreflexia after 3 or 4 hours of flying. It was nothing major, just some sweating and a tingling sensation in the face. I knew it was obviously due to sitting in the plane seat and having a different seating posture than what I was used to. I wasn't really sure what I could do to prevent it though. I used to just have my attendant boost me up in the seat just to change my position. That provided a temporary solution. The dysreflexia would leave for about an hour, but then it would come back again and I would do another boost to once again stop it. This was a pain because the longer the flight was, the more often I had to be readjusted, and it was really difficult for my attendant to move me in a plane seat. It wasn't until my flight back from San Francisco in 2001 that I figured out the secret to beating the dysreflexia. Since I don't sit in a plane seat every day, the back of the seat was clearly the cause of the dysreflexia (I was sitting on the same cushion that I sit on every day so that obviously wasn't the problem). So, I decided to try leaning forward for a few minutes every half hour or hour, just to take the pressure off of my back and to get away from that backrest for a few minutes. Sure enough, that solved the problem. Since I began the practise of leaning forward every so often to relieve the pressure on my back, I have not had a problem with dysreflexia at all, even on 10 hour flights. (1) When you arrive in your hotel room (or stateroom if you're on a cruise) don't be afraid to rearrange the furniture to a configuration that better suits you (or have them do it for you). Whenever I check into a new hotel room or board a cruise ship, the first thing I always do is have the furniture rearranged to maximize the space in the room. This usually involves having the staff remove 1 or 2 tables or chairs, as well as lining up the beds length ways against adjacent walls (in an L-shape) in order to create a large space in the center of the room to wheel around. I have stayed in some pretty small rooms, and rearranging the furniture has always worked quite well. (2) A lot of hotels and resorts can be misleading when you make reservations, so it is important to be clear on the booking policies with each property. For instance, many hotels and resorts refuse to guarantee a wheelchair accessible room at the time of booking. They will only put one "on request," which means there is a chance you could show up expecting to get an accessible room, but end up out of luck. Many hotels/resorts also have a variety of different disabled rooms, ie. accessible rooms with roll-in showers and accessible rooms without roll-in showers (bathtubs instead). Even though you specifically request a room with a roll-in shower, many operators will simply write "accessible room" in the reservation, and then when you show up they end up giving you one of the accessible rooms that has a bathtub rather than a roll-in shower (see California 2001). This is why it is important to be specific when choosing a property and making reservations. (1) Bring your disabled parking permit from home!! Most foreign states and countries recognize disabled permits issued by your home state or country. Rental vans generally do not include a disabled parking permit, and without one you will not be able to park in disabled parking spaces without risking a hefty fine. The fact that you are driving a van that is clearly a disabled van will not excuse you from a fine if you are parked in a disabled spot without a permit. We almost learned that the hard way in California when we found a US$300 ticket on our windshield (See California 2001). I found that the disabled parking permit is especially powerful in Europe, particularly in Italy (See Europe 2003, Florence 2003, Rome 2003). (2) When making the reservation for the van rental, make sure you specify the length, width, and height of you in your chair so that they reserve the appropriate vehicle for you. Otherwise you may end up with a vehicle that does not meet your needs, which almost happened to us in Europe (See Europe 2003). While I always prefer making reservations a few months in advance, most medical companies I have come across only need a couple weeks notice to rent equipment such as a hoyer lift or a wheelchair. In fact, I have had a number of occasions where I made a reservation a few months in advance, only to find out when I called to confirm my reservation a couple weeks before my arrival that they had no record of my reservation (see Kauai-Big Island 2002). I once had it where I made a reservation a couple months in advance for 3 hoyer lifts in Hawaii with 3 different companies, one on each of Oahu, Kauai, and the Big Island. When I called each company a couple weeks prior to my arrival to confirm each reservation, not one company had a record of my reservation. This is why I recommend still making the reservation a couple months in advance, but then confirming the reservation 2 weeks before arrival, and then calling to confirm the reservation one final time the day before delivery. Calling the day before delivery is very important as I have had a number of instances where the company messed upor just plain forgotthe delivery date (see Australia/Hawaii 2000, Hawaii-Los Angeles 2002, Europe 2003). Up to this point, I have used wheelchair accessible taxis in 6 American cities (Boston, Ft. Lauderdale, Miami, Las Vegas, San Francisco, and Los Angeles), 1 Canadian city (Vancouver), 2 Australian cities (Sydney and Canberra), and 1 British city (London). I discovered that getting an accessible taxi can be quite a stressful situation. It is really hit and miss. Sometimes a taxi would show up in 15-30 minutes, while other times we could be waiting an hour only to call back and be told that they had no record of our call. (see Boston 1998, Boston 1999, San Francisco 2001, and Los Angeles 2002). While I never had this problem in the Australian cities, that doesn't necessarily mean the same thing doesn't happen there. I have learned that when calling for a wheelchair accessible taxi, it is important to KEEP CALLING EVERY 20 MINUTES TO A HALF HOUR to make sure that someone is still coming. Of course, this is not a problem in London, England as every taxi is wheelchair accessible and they can be hailed right off the street. Too bad they're not all like that!